Frontpoint vs ADT | Which security company reigns supreme in 2018? This ADT Monitored Security vs Frontpoint Security Review pits the top professionally installed home security company against our Best Do It Yourself Alarm Company, Frontpoint. 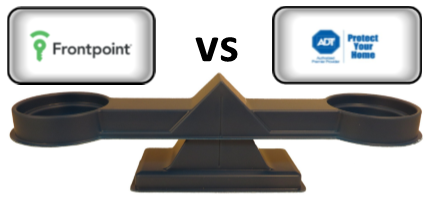 When comparing Frontpoint vs ADT, it is a little bit of an apples vs. oranges scenario. Aside from the fact that the former provides professional installation and the latter is self installed, there are a number of key differences that separate the two companies. Let’s take a closer look at what makes these two of the best home security companies….and see which one is a better fit for you. 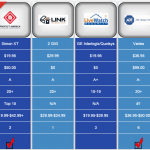 This is a comparative analysis of Frontpoint vs ADT in we contrast an assortment of characteristics in 5 separate categories. For the purposes of this review, each category is valuated equally. You can jump ahead to a specific category or area of interest bu clicking on any of the links to the left. In the summary section we determine a “winner” by tallying up the individual “rounds”, but your selection may vary depending on your priorities. Protect Your Home was founded in 1998 and is the largest Authorized Premier Provider for ADT, the number one name in the home security industry. All monitoring services are provided by ADT , which was founded 140 years ago as American District Telegraph and is the oldest and most recognized name in home security. In comparison, Frontpoint is a newcomer to the home security business…with less than 10 year’s experience. 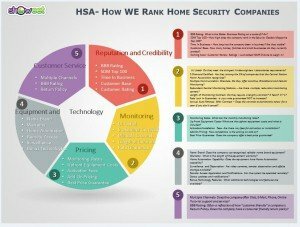 Nevertheless, in that short time they have become a consistent front runner in the DIY alarm industry and carved out a name for themselves by earning a reputation for providing a best in class customer experience. Their transparent and “no pressure” approach to home security has earned them an A+ BBB rating with very few customer complaints. While Frontpoint enjoys the same BBB rating and has far fewer customer complaints….at this point. they don’t have the the track record or name recognition that an ADT Authorized Premier Provider has. No one does. However….there are many who would argue that bigger isn’t necessarily better…. Nevertheless, when it comes to reputation and credibility…ADT Monitoring is virtually synonymous with home security….and has been for a very long time. Customers of both companies are protected, around the clock, by UL Listed, Five Diamond Certified monitoring stations. ADT owns and operates 6 monitoring centers to service their 6 million customers. This provides an additional measure of redundancy and allows calls to be routed to another command center in the event of a localized disaster in one of their monitoring centers. When it comes to contracts…Frontpoint offers greater flexibility with monitoring plans for both one and three-year agreements. ADT monitored systems require a 3-year contract. Frontpoint monitoring rates start at just $34.99 and are 100% cellular…where as ADT Monitoring starts a bit higher, $36.99, for landline service-charging significantly more for cellular service. Cellular service is inherently more secure as it prevents the possibility of defeating the system by cutting a phone or cable line. Overall, Frontpoint service is more cost-effective than comparable ADT monitoring services. Both of the companies have video surveillance available…and ADT monitoring offers 2-way voice capability. However, in my opinion, this is trumped by Frontpoint’s Alarm.com services which include Geo-Location Services and Crash and Smash Protection. The latter enables the monitoring center to detect a security breach and alert the authorities – even if the system is destroyed before a signal can be sent. This goes an extra step in providing total peace of mind. While ADT monitoring offers superior redundancy and 2-way voice, Frontpoint offers more advanced monitoring features, 100% cellular monitoring communication and more cost effective monthly monitoring rates. Frontpoint vs ADT Customer Service – What happens after the sale? Although the ADT Authorized Premier Provider does a good job addressing customer issues once they have been filed with the BBB, online reviews and customer feedback would seem to indicate there is some room for improvement when it comes to customer service. While both companies fare well when it comes to BBB ratings (A+), Frontpoint has very few complaints filed. Online feedback for Frontpoint is overwhelmingly positive…reflecting their strong commitment to customer satisfaction. This may also be a result of two different approaches to the sales process. The Frontpoint business model is far more passive….relying on internet lead generation from a very transparent and informative web site, to an inbound sales team that adopts a very consultative approach in which they focus on uncovering customer needs and providing the most cost effective security solutions. Because they are installing the system, ADT Authorized Premier Provider – Protect Your Home customers are only protected by the standard 3 Day Right of Recission and not 30 Day Money Back Guarantee. However, they do include the exclusive ADT 6 month service guarantee that says any service oriented issue will be resolved within 6 months. In the event that any service rated concerns can’t be resolved , the equipment will be removed and your money refunded. . (certain restrictions apply). 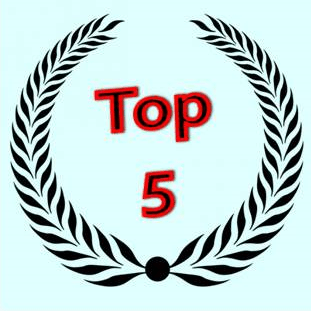 Another close category as both companies provide exceptional customer service…but, Frontpoint has proven that they have an overall stronger commitment to exceeding customer expectations and they offer an unconditional 30 Day Money Back Guarantee to ensure customer satisfaction. Both ADT and Frontpoint systems come with standard motion sensors and door/window sensors. If you select an interactive plan, you will be able to control the system remotely from your smartphone and the system will even give you a “door open” signal if the front door is left open. Security cameras can be added to either system to provide additional surveillance capability. Frontpoint systems will come pre-programmed. They are easy to install, as they are clearly marked and just need to be mounted in the proper locations. ADT equipment must be professionally installed. ADT equipment is manufactured by leading equipment suppliers and is provided and professionally installed by ADT Authorized Premier Provider – Protect Your Home. ADT offers a comprehensive equipment lineup to satisfy the needs of virtually any security situation. 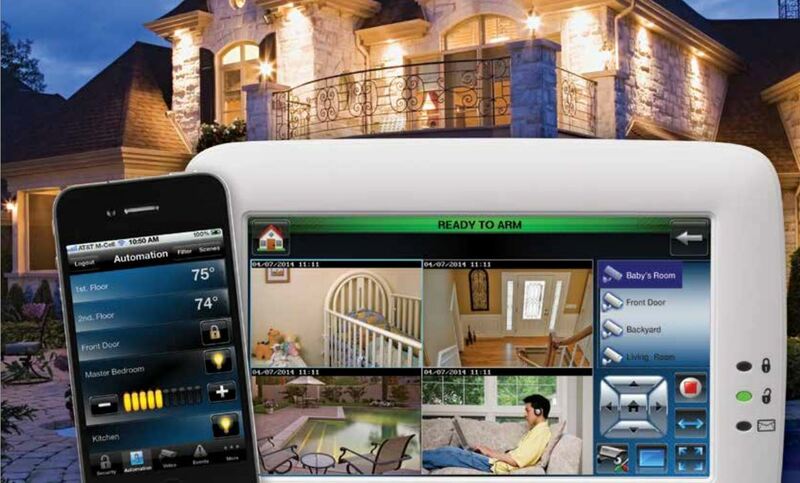 They have basic home security systems and ADT Pulse® for more sophisticated interactive home automation. Frontpoint uses the GE Simon XT as their standard control panel, with the optional Qolsys IQ for those wanting a more user friendly 7″ full color touchscreen display to manage more sophisticated home automation and energy management applications. Frankly, this category is too close to call. Both companies offer outstanding equipment and some very attractive advanced technologies. While the respective manufacturer reps would argue at great lengths, which features are superior and which are most important to the end user….I think that it really comes down to personal preference. Both companies offer quality, name brand equipment with similar feature sets and capabilities. However, while they both have similar base monitoring pricing, the slightly lower $34.99 Frontpoint monitoring is cellular– which is a far more secure means of communication. As one adds more interactive, home automation and video monitoring capabilities, Frontpoint is a far more cost effective monitoring solution. Both Frontpoint and ADT Monitored Systems have some advanced services which provide some product differentiation…and that will be a matter of personal preference or priorities. The ADT Pulse® App provides very cool voice control capability….but, some will lean toward the GPS automation functionality of Frontpoint, and Alarm.com’s Crash and Smash Protection. All of these advanced features add value to the home automation services provided by their respective companies. Additionally, when it comes to add on equipment, Frontpoint enjoys a significant price advantage with wireless door window sensors running $32…compared to $60. When it comes to Price and Value…Frontpoint is clearly the overall value leader. Both of these companies are among the best home security companies that you could select to help protect your home and family. When it comes down to choosing between an ADT Authorized Premier Provider and Frontpoint- for some, the selection may be as simple as choosing between DIY and professional installation. Despite the fact that Frontpoint has streamlined the entire process so that the end user merely has to place the sensors and call in to activate, there will always be those who insist on having even a wireless system professionally installed. However, for those who don’t want a stranger in the house and are willing to invest a few minutes to complete the process, there can be substantial savings and some benefits over an ADT Monitored Security System. . 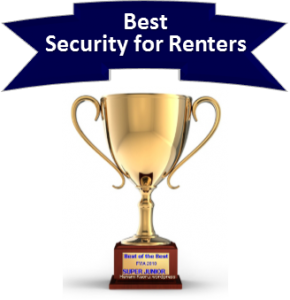 While they have a well deserved reputation for being THE #1 Name in the security business, ADT Monitored Systems are not the cheapest game in town….and Frontpoint offers an outstanding alternative for those looking for superior customer service and to save a bit of money. At the end of the day, we feel that Frontpoint offers a better overall value for the majority of those looking for the best alarm company to help protect their homes and family. Do It Yourself or Professional Installation- which is better? When it comes to installing a home security system, many people still envision having to drill holes in walls and fish wiring. But, these days, even the best home security companies that offer professional installation are primarily using wireless alarm systems. In many cases, they are installing the very same systems that are being used by the Best DIY Alarm Companies. As a matter of fact, the majority of the time that the technician spends in the home is typically “enrolling” (programming) the individual sensors into the system and waiting on hold to activate and test the system…during normal business hours-when, all the other installers are waiting to do the same thing. The best do it yourself alarm companies such as Frontpoint, Protect America and SimpliSafe (click on link to see our full home security reviews)… send out your system pre-programmed and tested…so that all you have to do is mount the devices and call in to get the system activated…which you can do at your convenience. No scheduling...no need to take time off from work…no waiting…no strangers in your home. And because you have become more engaged in the process- you will likely be more familiar with the operation of the system and more likely to utilize some of the more advanced features of the system. Often times installation technicians are in a rush to get to their next account. So while most people feel it might be easier to just have the system installed by a professional..not only will you likely be saving some cash- but, you will find that there are a number of other advantages you will gain by installing it yourself. OFF – Even when your security system is turned off, many of the alerts are still active. Both a Frontpoint and ADT system will still alert you if a door or window is opened. Life and environmental safety systems (i.e. water or low temperature) are still active. Stay- You can arm just the perimeter protection at the doors and windows by arming your either system in the “stay” mode. Away– The away mode will arm motion detectors as well as the doors and windows. Instant – You can eliminate the entry delay on either security system by arming it in instant mode. Duress – You can set up a special duress code that will notify the central monitoring center that there is a potential hostage situation. So when it comes to comparing Frontpoint vs ADT you will find that both companies offer a variety of arming options which can be tailored to meet your individual security needs. So which is best for me- an ADT Monitored System or a Frontpoint Home Security System? The short answer is …it depends. Ultimately, ADT Monitoring appeals to consumers who value experience and name recognition and are looking for professional installation. Frontpoint is designed for the customer who appreciates stellar customer service and is looking for the best overall value. For more information on Frontpoint, get more details in our Frontpoint Review. Thank you for visiting. Please feel free to leave your comments and feedback on this ADT vs. Frontpoint Security Review, below. ADT Pulse Remote installation starts at $199. ADT Pulse Video installation starts at $399. 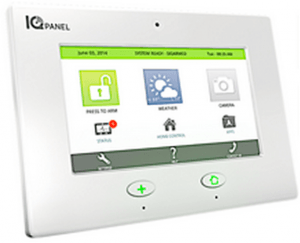 ADT Pulse Home Control with Video installation starts at $499. 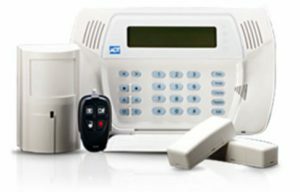 Burglary, Fire, Carbon Monoxide and Emergency Alert monitoring requires purchase and/or activation of an ADT security system with monitored Burglary, Fire, Carbon Monoxide and Emergency Alert devices. Fire, Carbon Monoxide and Emergency Alert services are an additional charge. Quality Service Plan (QSP) is ADT’s Extended Limited Warranty. 36-month monitoring contract required from ADT Pulse Remote: $52.99 per month, ($1,907.64), ADT Pulse Video: $58.99 per month, ($2,123.64), ADT Pulse Home Control with Video: $59.99 per month, ($2,159.64), including Quality Service Plan (QSP). Additional charges may apply in areas that require guard response service for municipal alarm verification. Prices subject to change. Prices may vary by market. Some insurance companies offer discounts on Homeowner’s Insurance. Please consult your insurance company. Local permit fees may be required. Satisfactory credit history required. Additional monitoring fees required for some services. Photos are for illustrative purposes only and may not reflect the exact product/service actually provided. For latest Frontpoint promos, call the Promotional Hotline - 1.844.688.2894 .... orClick Here!